Not to be confused with Crumble Cavern. 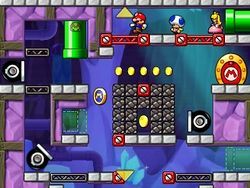 Crumbling Cavern is the fourth world of Mario vs. Donkey Kong: Tipping Stars. 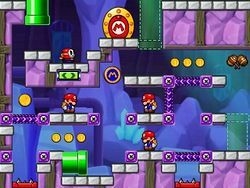 It introduces Movable Pipes, a pair of green Warp Pipes that can be picked up and repositioned in different areas. Once a Mini toy enters one of these pipes, it will be warped out of the other one in a different area. All other mechanics that debuted in previous worlds make a return in this world, though without as much focus put on them. 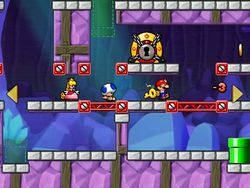 The only enemy species introduced in Crumbling Cavern, Fire Piranha Plants, are able to spit fireballs that bounce off the opposing surface and return to the sender, repeating the attack. 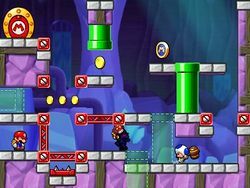 Other enemies found in this world are Cannon Kongs and a single Shy Guy. 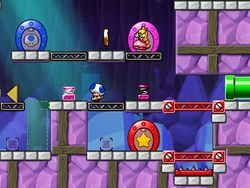 The background of Crumbling Cavern is a rugged underground zone with boulders and other mineral formations. Several pipes are spread between the rocks, and sewage flowing from a grated drain can be seen far in the background. 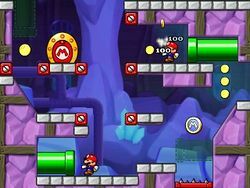 The blue or indigo-hued environment of this area is reminiscent of the underground levels of most Super Mario games. 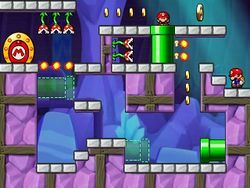 All the music themes used in this world are variations of the Underground theme from Super Mario Bros., which was also the basis for the themes of Magnet Mania from Mario vs. Donkey Kong 2: March of the Minis and Mario vs. Donkey Kong: Minis March Again!, as well as Secret Storage from Mario vs. Donkey Kong: Mini-Land Mayhem! 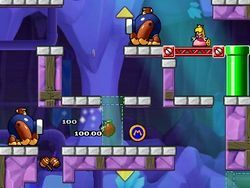 There are two Bonus Levels that are set in this world, B-7 and B-8. This page was last edited on December 13, 2018, at 23:25.